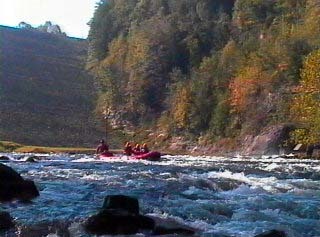 This stretch of the Pound River below Flannagan Dam is a short and easy stretch of whitewater suitable for novice whitewater boaters. Puting in directly below the dam outflow at the upper part of the tailwater picnic area (a developed area maintained by the Army Corps of Engineers complete with restrooms,picnic tables, playground and running,potable water ) allows the paddler to include the first and most challenging rapid in this section. Alternatively, this first rapid may be skipped by putting in the large calm water eddy at the lower end of the picnic area. Upon reaching the Bartlick Bridge takeout the paddler may choose to run the right chute or center chutes into the pool below or skip this final drop and take out above on river right. Caution is advised when running the right chute to scout for deadfall that ocassionaly appears. Caution is also advised when running the center chute between the Bartlick bridge pilings as there is a rather sticky, potential "keeper" hydraulic that may cause the novice or less skilled paddler difficulty. Following VA80 east towards Haysi,VA look for VA611 on the right about 5-6miles past the Breaks Park. follow VA611 till it crosses the Russell Fork at the Bartlick Bridge. Continue across the Bartlick Bridge over the Russell Fork and follow VA611 to the first road on the left. follow this road till it crosses over the Flannagan Dam then take the first road on the left across the dam which drops down to the dam tailwater picnic area. This section is totally dependent upon the Flannagan Dam releases for flow and is most often paddled during the annual fall whitewater releases every weekend in October.